There are set to be 31 fewer MPs from English constituencies after the next election as part of plans to cut the size of the House of Commons. The Boundary Commission has published details of where seats will disappear to meet the government's objective of cutting the number of MPs by 50 to 600. Wales is set to lose 10 seats while Scotland and Northern Ireland would see a fall of seven and two respectively. Labour, the SNP and Plaid Cymru have criticised the planned shake-up. Shrinking the size of the Commons from its current 650-strong membership was one of the coalition government's key proposals for reform of Parliament after the expenses scandal. Ministers say it will lower the "cost of politics" without reducing accountability. Constituency boundaries will also be fundamentally re-drawn to ensure that nearly all seats are roughly the same size. The independent Boundary Commissions of each of the four nations of the UK are responsible for drawing up the political map on which the next general election - expected to take place in 2015 - will be fought. Details of the re-drawn boundaries will only be finalised after a public consultation but must be agreed by 2013 in order to be in place for a 2015 poll. Under proposals announced on Friday, England will see its total number of seats drop from 533 to 502 with all regions set to see their representation fall. 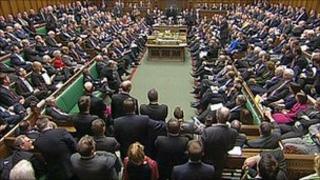 The North West of England is set to lose a proposed seven MPs. London and the West Midlands will have five fewer MPs each, while four MPs will go in Yorkshire and the Humber. The North East of England will lose three seats while South East, East of England, East Midlands and South West will have two fewer seats each. The number of MPs representing Scottish constituencies will fall from 59 to 52, the number of Welsh MPs will drop from 40 to 30 and Northern Ireland's quota will reduce from 18 to 16. The process is likely to result in a scramble for seats as MPs whose constituencies are disappearing attempt to find another route into the Commons by applying to become candidates in surviving seats. The Boundary Commission for England also said the majority of its seats would be affected by government plans to equalise the size of constituencies. This will require all seats - bar a handful of exceptions - to comprise of between 72,810 and 80,473 voters. No constituencies will cross national borders but critics say the shake-up will create seats spanning traditional county and local boundaries. "The review will result in significant change for many constituencies," Hugh Buchanan, secretary of the Boundary Commission for Scotland, commented. "The new rules put greater emphasis on equal electorates and as a result there may be more constituencies which cross local authority boundaries." Labour said they believed the Boundary Commission would handle the process "openly and impartially" - but they had "serious concerns" about the framework the organisation was being asked to deliver. "These rules appear to have been devised with political motives in mind," a spokesman said. "The government have never been able to explain why 600 is the right number for the Commons and 650 is not. They have never explained where that number came from and refused all attempts to conduct an independent assessment. "The rigid rules for drawing seats also threaten to undermine the Boundary Commission's ability to take account of geography, history and local ties when constructing constituencies." The SNP attacked what they said seemed an "completely arbitrary" reduction in seats in Scotland. "There is no science behind this, just rushed reforms by a Tory-government which does not care about the impact this will have on rural areas where MPs are already stretched," said the party's constitutional affairs spokesman Pete Wishart. And Plaid Cymru said the loss of ten seats would mean Wales having less of a voice on issues reserved for Westminster such as tax, defence and welfare. "Decisions on matters which affect the lives of Welsh people are made daily in Westminster and it is worrying to me that it is Welsh representation which will suffer most under these plans," MP Jonathan Edwards said. "Wales needs to be heard. Cuts to our voice in Westminster mean less input into issues on defence, policing and other key issues."